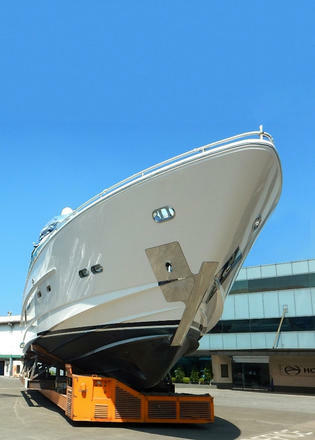 Taiwan-based yard Horizon has announced the launch of the 20th hull in its E88 superyacht series. Built for an American owner, the new 28.5 metre yacht is due to go on display in November at the Fort Lauderdale International Boat Show. This latest version of the Horizon E88 has been heavily customised with a hydraulically opening beach club and an enclosed skylounge, Horizon Yachts adds. The interior décor was created by an in-house design team with light oak panelling in a semi-gloss finish contrasting with the rich teak flooring. Neutral stonework and blue accents on the pillows complete the luxury island living aesthetic. 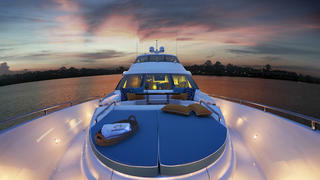 Guest accommodation is all below decks, comprised of four en-suite staterooms, including a full-beam master cabin. 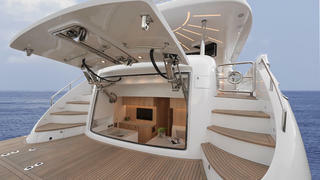 For additional privacy, the crew quarters are located to the aft of the engines. Other key features on board include a foredeck seating area, a 55-inch LED television in the saloon and a dedicated dining area for all ten guests to enjoy a meal together. Power comes from a pair of 1,900hp Caterpillar engines, while zero speed stabilisers ensure a comfortable night’s sleep at anchor. Horizon adds that the owners were particularly drawn to the E88 because its shallow 1.68 metre draft will allow them to explore remote islands. 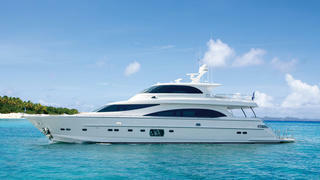 The flagship of Horizon’s Elegance collection, the E88 features exterior styling by Swedish designer John Lindblom. It has proven to be a particularly popular series for the Asian yard, with nine hulls launched in the last four years alone.